This book is to model creativity using computational approaches in Python. The aim is to construct computer models that exhibit creativity in an artistic context, that is, that are capable of generating or evaluating an artwork (visual or linguistic), etc. This book is an introduction to physical modeling using a computational approach with Python. You will learn how to use Python to accomplish many common scientific computing tasks: importing, exporting, and visualizing data; numerical analysis; etc. This book addresses all the important aspects of a computer simulation study, including modeling, simulation languages, validation, input probability distribution, and analysis of simulation output data. This is an authoritative guide to generating readable, compact, and verifiably correct MATLAB programs. It is ideal for undergraduate engineering courses in Mechanical, Aeronautical, Civil, and Electrical engineering that require/use MATLAB. This book is a complete guide to AMPL for modelers at all levels of experience. 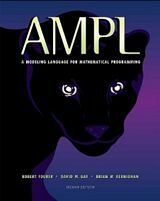 It begins with a tutorial on widely used linear programming models, and presents all of AMPL's features for linear programming with extensive examples. A range of programming strategies and techniques behind computer simulations of natural systems, from elementary concepts in mathematics and physics to more advanced algorithms that enable sophisticated visual results, using Processing. It presents both new theories and their applications, showing bridge between theoretical investigations and possibility to apply them by engineers of different branches of science. The purpose of this book is to introduce researchers and practitioners to recent advances and applications of Monte Carlo Simulation (MCS). Random sampling is the key of the MCS technique. This is a textbook for a course in mathematical probability and statistics for computer science students. Present the procedural steps required for modeling and simulating the basic dynamic system problems in SIMULINK, built on the top of MATLAB to provide a platform for engineers to plan, model, design, simulate, test and implement complex systems. In this book a collection of applications covering a wide range of possibilities is presented. We go from simple or distributed control software to modeling done in LabVIEW to very specific applications to usage in the educational environment. This book teaches you the basic building blocks of programming needed to create cutting-edge graphics applications including interactive art, live video processing, and data visualization, using Processing.. This is the previous page of Computational Simulations and Modeling, we are in the processing to convert all the books there to the new page. Please check this page again!! !